When animals develop relationships they tend to prove that they are incredibly loyal creatures of nature. A pack can stay together for life, protecting each other from danger while forming some pretty incredible bonds. What might be most amazing is that many animals will form attachments to animals that are not even of their own species. From dogs growing up with cheetahs to an adorable kitten and puppy relationship, we’ve found amazing before and after photos of animals growing up together. Relationships are hard but these animals will inspire you to work on your own. 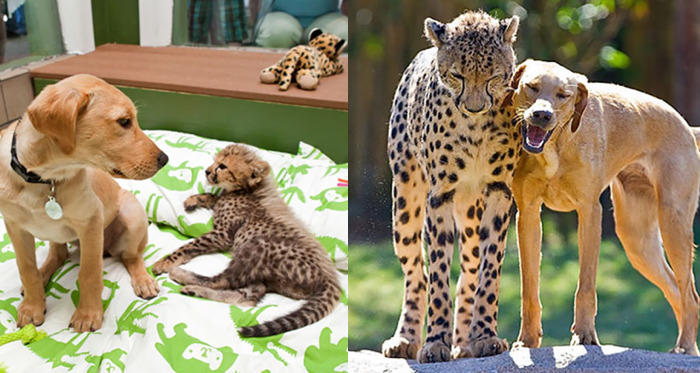 This cheetah met their long-time dog friend when they were both babies. The two animals spent so much time together that they remained very close. In nature, this odd pairing may have never occurred but thanks to their early contact this pair still live together and play every day. Sadly, our dog friend probably never wins a race against their friend. If only all humans could get along as well as this cross-species pairing the world would be a better place. It’s not the strangest odd animal pair we have seen but it’s definitely one of the cutest on record.